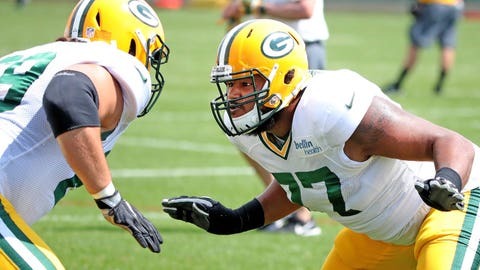 Adding depth to their offensive line, the Green Bay Packers promoted guard/tackle Adam Pankey to the active roster and released defensive tackle Ricky Jean Francois to make room. As a vested veteran who was on a Week 1 roster, Jean Francois is guaranteed his base salary of $1.25 million. Signed in the offseason by the Packers after spending the past two seasons with Washington, where he played all 16 regular-season games in 2015 and ’16, Francois only saw the field for six defensive snaps in Green Bay’s season-opening win over Seattle. With Bryan Bulaga not playing against the Seahawks and perhaps out for this Sunday night’s game against Atlanta, Pankey gives Green Bay a little insurance along the offensive line. An undrafted free agent from West Virginia, Pankey was signed by the Packers on May 5. After not making Green Bay’s final cuts, he was signed to the practice squad. With the Mountaineers, Pankey appeared in 45 games at both guard and tackle with 36 starts and was named second-team all-Big 12 as a senior. To fill Pankey’s spot on the practice squad, Green Bay signed offensive lineman Darrell Greene, who spent 2016 on Philadelphia’s practice squad.